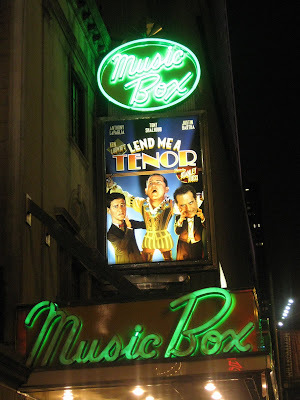 Thanks to an invitation from the press agent, I saw the new revival of Lend Me a Tenor at the Music Box last Wednesday. Wow! It was REALLY FUN! Rarely have I laughed that much in the theatre. Lend Me a Tenor is a farce set in the 1930s in Ohio. An opera company has hired a famous Italian tenor to sing at their tenth anniversary gala performance. The evening doesn't go as planned. Hilarity ensues. The ensemble cast is comprised of Justin Bartha (Broadway debut), Anthony LaPaglia, Tony Shalhoub, Brooke Adams, Mary Catherine Garrison, Jay Klaitz, Jan Maxwell and Jennifer Laura Thompson. Stanley Tucci makes his Broadway directorial debut. Tony Shalhoub, Justin Bartha and especially Jan Maxwell were screamingly, side-splitting funny. I believe that there is nothing that Jan Maxwell can't too - she is a genius. The set, a hotel suite, is by John Lee Beatty. The use of doors within the suite is very effective. The costume design by Martin Pakledinaz is lovely and quite perfect, and is used as prop as well. There are even opportunities for a little audience participation for those sitting in about the first five or six rows of the orchestra - or maybe it should be that the audience should keep their eyes open and hands ready. The pacing of this phsysical comedy didn't stop - it races by and the audience loudly and very enthusiastically shared their approval with roaring laughter and applause. Even the curtain call itself is genius. In a rather drab 09/10 Broadway season, this play is not to be missed for a good time in the theatre. Tickets are available via Telecharge and is scheduled to run through the summer. Jan Maxwell certainly brightened up both the fall and spring this season - and pretty much proves she's just one of the greats. I laughed so so hard, it was almost criminal!